While steel tiny houses are not usually the do-it-yourselfer’s first choice (due to the learning curve) and new option for building steel tiny house frames is taking root. I use the term ‘new option’ loosely. 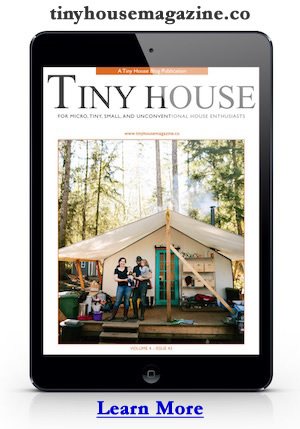 The first year I began blogging about the tiny house movement (2008) I met a fellow named Bill who was building tiny houses in Sonoma County, California. He had partnered with a local company to build steel tiny house frames similar to the ones pictured here. So truth be told… this technology has been around for a while for commercial construction, but is now really taking off for tiny houses. In a nutshell, imagine drawing a tiny house design on paper and sending it off to a local steel frame manufacturer. They make a CAD drawing of your design and engineer all the needed steel panels. Then the real magic begins. They stick the CAD drawing on a USB thumb drive and pop it into a machine that works a lot like a printer. It’s fed by a spool of sheet steel like a printer is fed by paper. But instead to spraying ink, it punches, drills, folds, and cuts the metal into all the parts defined in the CAD drawing. Then a crew of builders on staff assemble the individual parts into wall, floor, and roof panels. Once all the panels are complete they can either ship it off to you for assembly, or they can assemble it for you on your tiny house trailer. They can even sheath the house. The end product is a tiny house shell that’s stronger and lighter than wood. You finish it off like a normal tiny house with all the wood you like. In the end you get the house you wanted and finished off inside and out with whatever materials you choose. The main disadvantage is that future changes are not easy. If your house was made of wood, you could remodel it just like a normal wood framed house – still not an easy task, but easier than a steel framed house. But this seems like a minor issue when you add up the benefits of saving weight and having a super strong engineered tiny house frame. One of the leading companies is Volstrukt, located in Austin, Texas. Check out the Volstrukt website to learn more about this construction option. They even offer some tiny house designs to choose from – which might save you some of the CAD drawing cost. Photos are via the Volstrukt Instagram. Does your company provide this service too? Leave an introduction and your website address in a comment below. This entry was posted in Builders, Construction Method and tagged austin, cad, Steel, steel framing, texas, tiny house, Volstrukt. We used steel for our Tiny on foundation. Worked for us because we could take our time on a self-build and not worry about wood rotting in the rain for months. It was also much lighter so my wife was able to help, even with the 18′ joists. Since we’re in the middle of a forest, it’s also structurally sound in that it’s bug, fire and water proof. It was a bit harder to work with than wood but the end product is great! Great idea i want some more idea . Wondering if you sell blueprints? The Steel Kits are complete and you simply attach the panels using screws. No blueprints/plans needed to assemble. We can help with custom design.